When he is not teaching Lindy Hop, Peter Strom roams the earth personally recommending what music people should listen to. He has been a featured instructor at workshops all over the world from Australia, to Korea, to Sweden, to France and more, as well as all over the States. He has won titles from such competitions as ALHC, NADC, NYLHO, ULHS, and the USOSDC, some of the fanciest acronyms in Lindy Hop. He is also a 2006 Finnish wife-carrying champion (seriously). 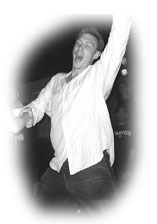 Specifically, Peter is most passionate about social dancing and its technique, in both Lindy Hop and Finnish wife-carrying, and he is a member of the fancy-footed Silver Shadows Lindy Hop reenactment group. Ask Peter how you can pay him in guacamole. 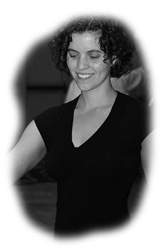 Melissa Varriano, more notably known to all as Mel, was introduced to the wonderful world of Lindy Hop in the Fall of 1998 while residing in San Diego, CA. Since that day she has dedicated herself to traveling all over the United States and Europe, taking workshops from numerous talented instructors, teaching classes in several locations, competing at various events, organizing local events, and dancing the nights away whenever possible. On October 23, 2003, Mel injured her knee and had ACL reconstructive surgery along with orthroscopic surgery on her Meniscus. She has since fully recovered and is back in the world of dancing, traveling, and teaching. Opening dance for the month. If you want to improve as a partner dancer, then it's essential to peel back the layers of what you already know and learn some new ways to make partnering easier and more comfortable, more nuanced, and plain old better. Peter's here to help you do just that. Making your leading not just clear, but comfortable, and convincing. Learn to lead with conviction and smoothness so that your follows have more fun. A leader's perspective on what feels good and what doesn't. Learn to be a more sensitive follower and have an easier time following while being able to put more of yourself into the dance. Once your dancing is in the groove, it's all musical and things can flow naturally. Learn how the music works and learn how to express it better in your dancing. The classic sounds of the Mouldy Figs will be heard at Tapestry this Saturday, playing for TCSwing's 1st Saturday Swing Dance. This event will cost 8/10$ and is hosted by TCSwing. Great chance for both leaders and followers to challenge themselves. From one simple move we'll expand the options to keep followers on their toes and keep leaders clear and confident. Followers and leaders learn how to keep things smooth and comfortable while changing the partnership from monologue to dialogue.